The first Melbourne Cup held in 1861 was certainly a dramatic event. According to legend, Archer the first horse to win the Melbourne Cup was reported to have walked 850 Km (560 miles) from Nowra to Flemington to be a part of a race. A modest crowd of four thousand watched the seventeen starters and the thrilling lead up. Before the race began, Twilight started early and was captured only after he had run the whole course, and tragically, two horses, Dispatch and Medora, died after a fall. 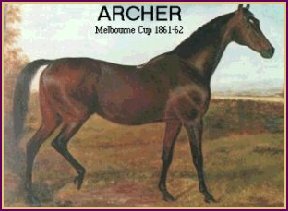 The following year Archer raced again to win his second successive Melbourne Cup. Although it is rumoured, he again had walked from Nowra to Flemington, many people thought it was more likely that he had travelled anonymously by ship. Despite his his owner's intention to race Archer for a third Melbourne Cup, he was unable to do so because of a technical error. The acceptance nomination to race failed to arrive in time because it was delayed in the post. As a result owners withdrew many horses, in a show of solidarity. This left a starting field of only seven horses, the smalles field in the history of the Melbourne Cup. Archer was foaled near Nowra in NSW in 1856 from the dam Maid of Oaks and sire William Tell. At ten years of age, Archer fell in a race and was retired to stud. The story of Archer is immortalised in a film bearing his name.